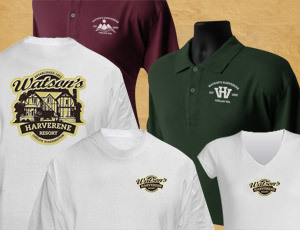 Design Hovie Studios, Inc., has designed the brand identity and apparel for Watson's Harverene Resort. Watson's Harverene Resort is a historic 100+ year old resort located on the shores of Lake Chelan in central Washington state. Design Hovie Studios created the new brand using a rustic, historic feel consistent with the resort and its surroundings. The main house / lodge was given center stage and embellished with crafted typography. The apparel showcases the new brand as well as the secondary WH logomark created to reflect the resort's western feel and fine collection of prize winning Belgian horses. The entire project was a 2 month process designed in Seattle under the Creative Direction of Hovie Hawk.